CLEMSON, S.C. - The Tigers host No. 4 Georgia on Tuesday night in the first of two meetings with the Bulldogs this season. • Clemson swept Virginia Tech on the road in three games by a combined score of 32-14 last weekend. • The Tigers are averaging 7.3 runs per game and hitting .276 with a .386 on-base percentage and 53 steals. • The pitching staff has a 3.33 ERA, .233 opponents’ batting average and 2.99 strikeout-to-walk ratio and Clemson is fielding .965. • Georgia is led by sixth-year head coach Scott Stricklin. • The Bulldogs won two of three games at Kentucky last weekend. They are hitting .280 and have a 2.85 ERA and .980 fielding percentage. • LJ Talley is hitting .370 with four homers and 18 RBIs, while Aaron Schunk is batting .318 and has a team-high nine saves. 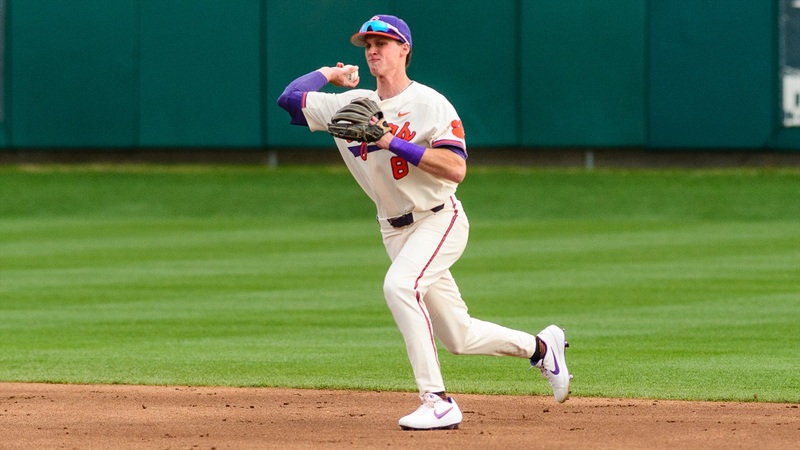 • The Tiger and Bulldogs played two games last year, but neither was at Clemson, as the two played a neutral-site game at North Augusta, S.C.
• Clemson's bullpen has a 3.29 ERA, .230 opponents' batting average and 146 strikeouts in 117.2 innings pitched. • The Tigers are 19-2 when outhitting their opponents and 3-4 when getting outhit. • Former Tigers Steven Duggar, Dominic Leone, Brad Miller and Tony Sipp are on 2019 MLB rosters. • Duggar is in his second year, Leone is in his sixth year, Miller is in his seventh year and Sipp is in his 11th year. • Duggar was a two-time All-ACC player as a Tiger from 2013-15 and made his MLB debut with the San Francisco Giants on July 8, 2018. • Leone, who had a 16-8 career record at Clemson, made his MLB debut with the Seattle Mariners in 2014. • Miller, the 2011 ACC Player-of-the-Year, hit .339 with 36 doubles, eight triples, 16 homers, 135 RBIs and 46 steals in 191 games as a Tiger. • Sipp batted .280 and had a 2-2 pitching record for the Tigers in 2004. • Every Tiger team from 1974 to 2015 has had at least one future major leaguer on its roster.